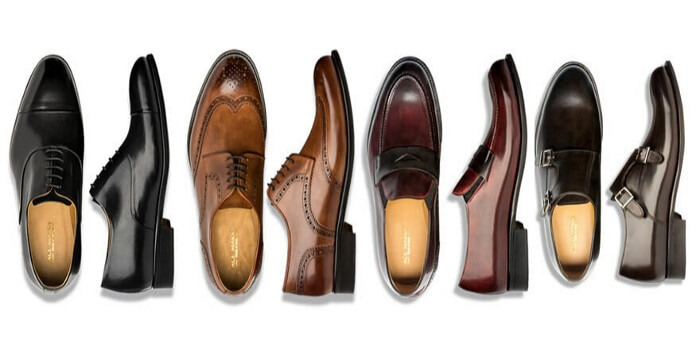 Men's dress shoes come in so many shapes and sizes that they can be difficult to shop for. What does that mean gents? If style matters to you – knowing your shoes needs to be a top priority. Like it or not – your shoes will draw more attention than most other pieces in your wardrobe. The right pair of shoes for the right outfit can take your look to another level. That's why I've come up with 5 men's dress shoes every guy should own. I've been talking about Ace Marks since 2016 because I absolutely love their handcrafted dress shoes for the modern man. Ace Marks are a family business run by 4th-generation artisans – so you can bet they know their craft. Think premium leather – hand dyed and hand burnished – and memory foam cushioned insoles that mold to your feet over time for all-day comfort. Similar products cost upwards of $600 but Ace Marks cut out the middle man and pass the savings on to you. This means you get stylish footwear for less than half the retail price. 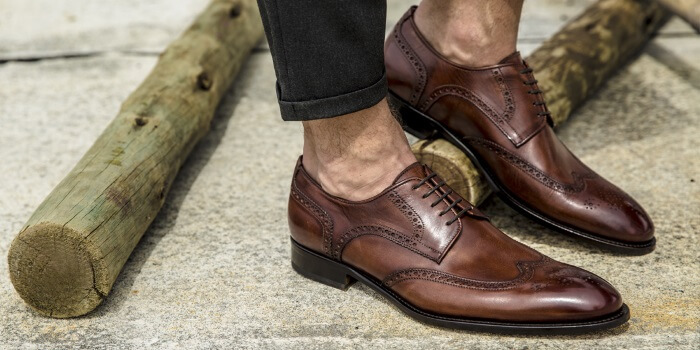 Click here to check out Ace Marks Italian leather dress shoes and dress shoe accessories and take advantage of free shipping to the US! Alright gentlemen, let's talk about the shoes you MUST have in 2019. The wholecut Oxford dress shoe is made from a single piece of leather. Why is that a big deal? Because such a large piece of unblemished leather is especially difficult to find, making the wholecut more expensive. Like the wholecuts you see here? Click here to find them at Ace Marks. Gents, this shoe goes great with most outfits and situations. A pair of black wholecuts will make the cut for black-tie and business-formal occasions. You can also dress them down by purchasing them in brown or burgundy. Brown wholecuts look beautiful with a charcoal or navy suit. If you want to add a bit of bold panache, oxblood is a great choice: it goes especially well with an otherwise all-black ensemble. In the right color they'll make you stand out in any boardroom or ballroom. There's a reason why wholecuts are the first on my list. You can't beat them when it comes to sheer elegance. Until about 50 years ago, loafers were dismissed as inappropriate in almost all formal business settings. Nowadays men's style is increasingly influenced by convenience and trends towards more casual – even in business settings. Loafers like the monk strap have made a comeback. Its history goes back over a thousand years. 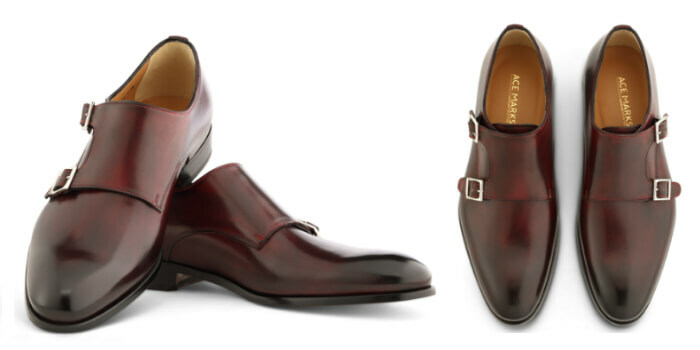 Double monk straps from Ace Marks can take your casual game to another level. Click here to find out for yourself. Life wasn't easy for holy men in the 15th century. Quite often monks would plow fields and tend crops as part of their daily routines. At first they wore single-buckled sandals to do a lot of this labor but eventually there came a need for more protective footwear. The sandal slowly evolved to cover the entirety of the foot. Fast-forward a few centuries and we now have a shoe that men love for reasons far beyond its inception as a foot guard for friars. Though the single-strap design is more true to its origin, I prefer the double-strap because the buckles are less clunky. Some people argue that the double-monk can be dressed up, but with it being a loafer – I have to disagree. In general, loafers are casual shoes to be worn in the spirit of classic men's style. What's nice about the monk strap is that it's still formal enough to wear with a suit. That said, it might be better to pair it with a more casual suit – it's not the best choice for an interview at a law firm or a meeting with the Board of Directors. I recommend having fun with this shoe. Since it's casual, there's no harm in trying it in some bolder colors to draw more attention. If you haven't tried shoes in brown or even green or blue, a new pair of monk straps is your chance to shine! The main reason you want to opt for dress boots is simple – weathering the elements. Boots are sturdier and offer more protection than regular shoes. They're great choices if you want a shoe that can take a bit of wear without losing its style. The two most popular types of men's dress boots are Chelseas and Chukkas. The Chelsea boot traces its lineage to the British Chelsea Boot Company, founded in 1851. This shoe's distinguishing mark was a swatch of elastic on either side of the ankle (also known as the side gore). You won't believe how easy Ace Marks' Chelsea boots slip on. Click here to see for yourself. Chelsea boots remain famous for this feature today, which allows the wearer to slip them on and off with ease. The company designed them as riding boots – the absence of laces being evidence for this and they remain popular with horsemen to this day. No one knew them as “Chelsea” boots until the 1950s, during which several rock bands contributed to their popularity. John Lennon and Paul McCartney requested variations with Cuban heels to make them look taller. Members of the Rolling Stones also wore Chelsea boots quite often – quickly securing their place as a standard of men's footwear. Chukka boots also have equestrian origins and they share their name with the timed segments of the game of Polo. While a lot of men's style started with the military, the reverse is true for the Chukka boot. The British army adopted a variation of this already well-known shoe for use in the desert during World War 2. Afterwards it evolved back into civilian footwear, maintaining its understated yet eye-catching look. 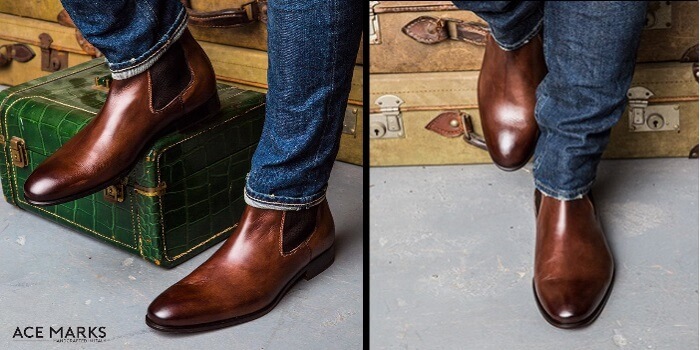 Why do these two boots belong on a list of the best men's dress shoes? Simple: they drive home that combination of elegance and strength that's so essential to stylish menswear. The Chelsea is perhaps a bit more formal, but both boots work well for dressing down outfits. Try pairing them with a sport coat and dark jeans or a patterned button-up and khakis and click here to learn more about Chelsea or Chukka boots. The Blucher arrived when Prussian Field Marshal Gebhard L. Von Blucher decided his troops needed better footwear to take on Napoleon's army. Prior to that, the Prussian army relied on low-cut shoes with gaiters for battle. The shoe he designed had side pieces that lapped over the front with looser inner edges and lacing over the tongue. Did these shoes give his men the edge? We can't say for sure. But it was Blucher's army that dealt the killing blow to Napoleon at Waterloo. Click here to check out this beautiful Ace Marks' Blucher. The design became the standard for armies in the 19th century and even became a civilian classic. Bluchers are great men's dress shoes for the town and they're a surprisingly versatile shoe – looking equally good with a pair of jeans or even a suit in certain situations. The Blucher is especially great for men with higher in-soles in due to the open frontal design, giving more room on the instep than most others. Do you want something that boasts versatility, comfort and a warlike reputation? Look no further than the Blucher. 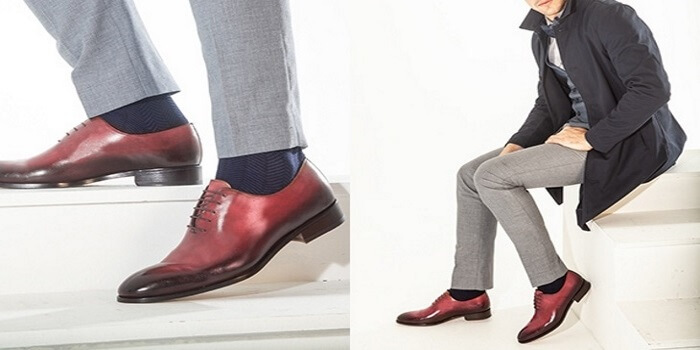 When it comes to the best men's dress shoes, none are as prevalent as the Oxford. This shoe goes back to – you guessed it – Oxford University. As students rebelled against high-rising boots in 1800, they adopted the Oxonian half-boot as a comfortable alternative. The Oxford – with side-lacing into the instep – became a norm for students and subsequently took the world by storm. Don't skimp out on these quintessential oxford shoes. Click here to find them on Ace Marks. 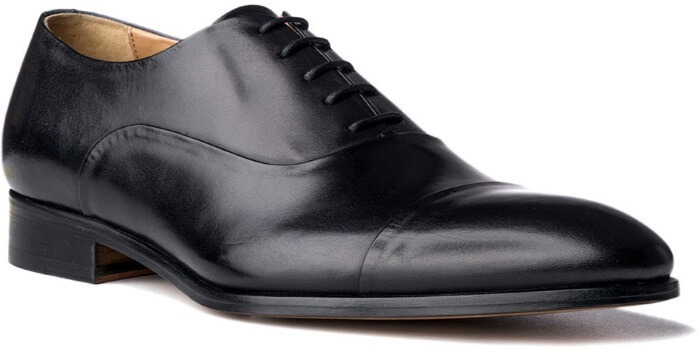 Every man needs to own a straightforward pair of black Oxford shoes. Why? Because this is your workhorse. These shoes are going to pull off anything you wear, whether it be a tux, a business suit or a casual suit. The plain black Oxford will be there for when you want to show the utmost professionalism and respect without drawing too much attention to yourself. This is your go-to shoe. Gents, we've talked a bit today about the best additions you can make this year as far as footwear. There are many more excellent options out there, but these are a great way to consolidate the essentials. With this list, you've got shoes that best encompass style and versatility – truly the best men's dress shoes on the market. Every Ace Marks shoe is handmade – from the way they burnish the leather to assembling the shoe itself. Ace Mark's handcrafted Italian dress shoes use only 100% premium full grain calfskin leather. To top it off, they're even great for your feet – Ace marks use memory-foam insoles that conform to your feet faster than other shoes. The leather they use is flexible and light which makes them perfect for any occasion. The best thing about Ace Marks though is how they talk to their customers. They rely on customer feedback and crowd-design for new lineups and designs, so there's no doubt they'll be listening to what you have to say. With quality and customer service like this, it's a no-brainer. Click here to revolutionize the way you wear shoes with Ace Marks!